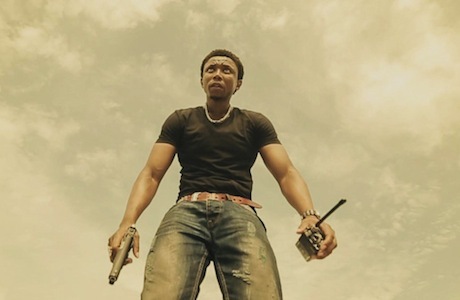 One of the most regularly recycled set ups for filmmakers that lack creativity when it comes to framing a story turns up in South African heist movie iNumber Number. Frustrated with a lack of respect, low wages, high risk and rampant corruption in the department, a good cop flirts with playing dirty. Chili (S'dumo Mtshali) and Shoes (Presley Chweneyagae, Tsotsi) are best friends and even better partners. An over-the-top, completely arbitrarily stylized opening fracas goes to great pains to demonstrate how complementary their methods are — Chili is a nigh-unstoppable super-cop and Shoes is his eyes, brains and conscience. After being asked to lose some evidence in order to get a reward they should have already received for apprehending some vicious gangsters, the duo feel like they're the only honest badges left on the force. Sick of missing out on the gravy train and swearing it's a one-time-only thing, Chili decides to get in on a big time heist being organized by one of the gangland kingpins he's been working himself into the good graces of as an undercover agent. His expectant father partner wants nothing to do with it, not even for the kind of cash that would put his unborn child through university. To add a little essence-of-Reservoir Dogs to the mix, writer/director Donovan Marsh works a variation on the "mole among criminals during a heist gone wrong" angle into his flashy and forgettable police caper. On full display from the outset, Marsh's random, arty indulgences are pretty to look at but ring hollow. There isn't a great deal of intent behind his specific stylistic choices — "because I can" and "it looks cool" is all the justification he needs. Despite being a rather by-the-numbers game of cops and robbers, iNumber Number is never dull, due more to the engaging personalities portrayed by the very capable ensemble cast, rather than any of Marsh's cinematic trickery. Action thriller fans interested in a familiar story in a foreign locale are sure to be among the film's most vocal proponents.